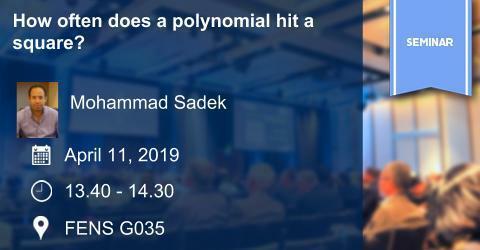 MATH Seminar: How often does a polynomial hit a square? FENS Mathematics MATH Seminar: How often does a polynomial hit a square? Title: How often does a polynomial hit a square? Abstract: Given a polynomial with integer coefficients, number theorists investigate the possible values that this polynomial may attain over the set of rational numbers. In particular, they have been extensively studying the possibility of a polynomial to assume a square rational value. It turns out that seeking an answer to this question ties number theory to geometry. A Polynomial in one variable will lead us to study the arithmetic of algebraic curves. We will spend sometime explaining the geometry beneath the question when the degree of the polynomial is 3. If the polynomial is in more than one variable, then the geometric structure is remoter. In the latter case, we will present some of the old and recent developments in the theory. BIO: Dr Sadek earned his PhD from Cambridge University in 2010 before joining AUC in Fall 2010. His field of specialization is number theory and arithmetic geometry. His research interests cover computational number theory, arithmetic of elliptic and hyperelliptic curves and Diophantine sets.